Like all concerned mothers, Victorine Minoarison and Helene Baotlata sacrifice for their families. They skimp on their own meals so their children can eat more. They work hard in their fields in rural Madagascar to harvest enough rice to sell and eat throughout the year. For years, those sacrifices paid off. Each time they took their young children to monthly weighing sessions at the Mahatsara community health center, Helene's son Vigrais and Victorine's daughter Feline showed healthy weight gain. The most careful planning and stockpiling of food, however, were no match for Cyclone Giovanna in February 2012. With winds exceeding 90 miles per hour, it devoured homes, destroyed rice fields and uprooted fruit trees. Victorine and Helene lost everything. "Before the cyclone, we ate rice three times a day," says Victorine. "After the cyclone, how often we ate depended on whether or not we could access food." The families had no money. They had nothing to sell. The price of rice went up 15 percent. Their weakened children stopped playing and slept instead. Two months later, the scale at their children's monthly weighing session showed they were undernourished. Fortunately, the families had Strengthening and Accessing Livelihood Opportunities for Household Impact (SALOHI), a program that works to provide safe, nutritious food. Catholic Relief Services and our local partners are implementing this project, which is funded generously by the American people through the U.S. Agency for International Development. SALOHI teamed up with the community health center to help protect young children from hunger. Helene and Victorine enrolled immediately in a 12-day nutrition and hygiene program. They learned from local mothers with healthy children how to keep their children well nourished, even when resources are scarce and or cyclones strike. Villages like Mahatsara, located on the country's central east coast, are particularly prone to severe weather, and one lost harvest can put families back for years. The eastern and southern coasts of Madagascar were strategically selected for this program to help provide a cushion against hunger while working to find long-term solutions. Helene and Victorine learned to combine corn with milk and sugar for a tasty treat. They learned that bananas and shrimp, or peanuts and greens, make a much healthier meal than a bowl of white rice alone. Nutritious meals and improved hygiene and sanitation practices revived Feline and Vigrais. One problem remained: Giovanna had destroyed their fields and wiped away their money. Rice may not be as nutritious as peanuts or dried fish, but it costs much less. Paying extra for Viagris and Feline's meals meant that others in the family would have to do without. The mothers faced a dilemma. Should they sacrifice the health of their other children for their youngest? Or would they risk allowing their little ones to grow listless once again? Not wanting to answer either question, they posed another: How could they make sure that all their children continued to eat enough without spending more? Alone, each of them had just enough money to purchase ingredients for one weekly high-protein, high-calorie meal. Victorine and Helene did what all smart mothers do: They improvised and began working as a team. "We cook together for financial reasons," says Victorine. "If she has ingredients I don't have, she covers me, and other times I cover her. This way we make sure we have everything we need." By pooling their ingredients, they are now able to provide two special meals a week for Vigrais and Feline. Now, both children have been able stay healthy. Although Cyclone Giovanna was a devastating blow for the women and children of the village, fortunately it was not a fatal. "There were no deaths after Giovanna because of malnutrition," says Helene, "because SALOHI helped us monitor and feed our children. It gave us the help we needed to get us through the most difficult time." 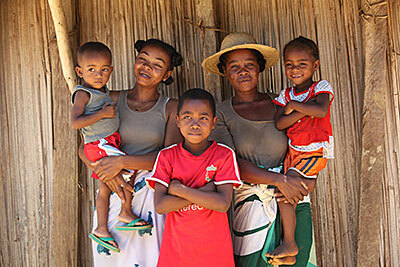 Learn more about what CRS and SALOHI are doing to keep kids healthy in Madagascar.